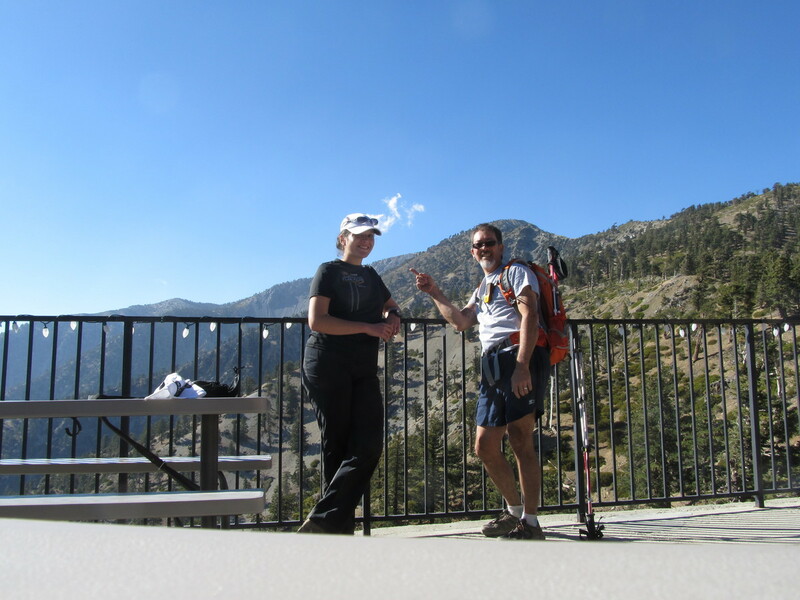 Last year’s government shutdown involved a good bit of hiking in the local mountains. 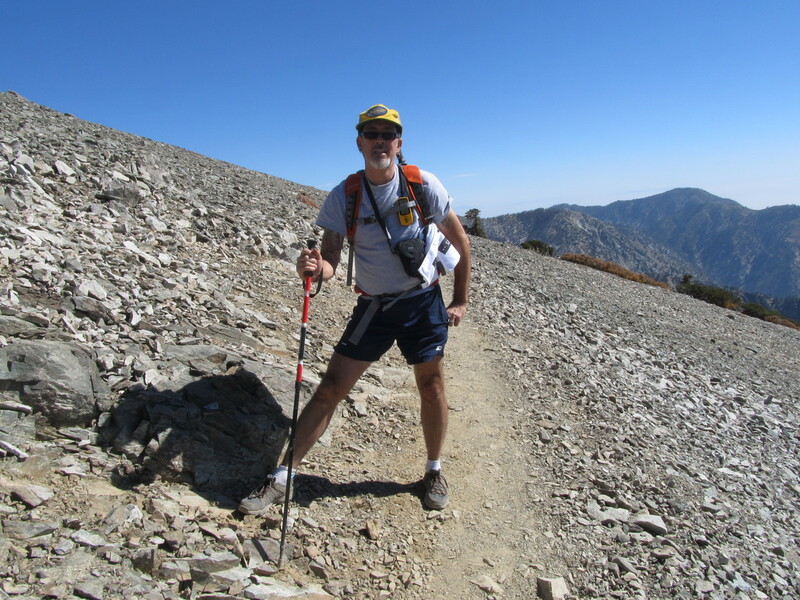 Since there was no furlough-cation this year, we had to take a weekend day to go climb Mt Baldy. We wanted to do it before November, since it’s going to get cold up there, and there could be snow. So today was the last available day in October. Like last year, I went with Karina from my office. 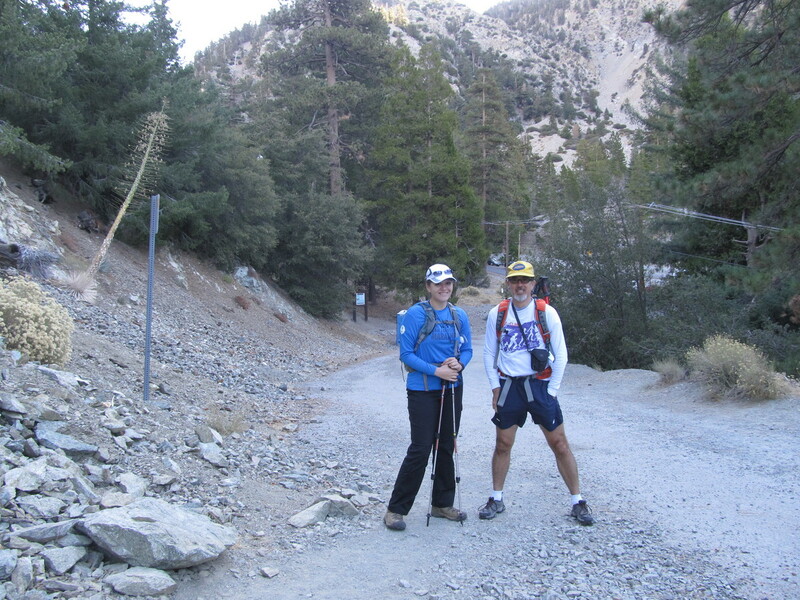 We went up to Manker Flat to the trailhead. On the way up there, I collected a new animal crossing sign for my collection. When we started up the trail, we got a nice view of San Antonio Falls. Even with the drought, there was still a little bit of water going over the falls. Just hearing running water is such a novelty for us these days. 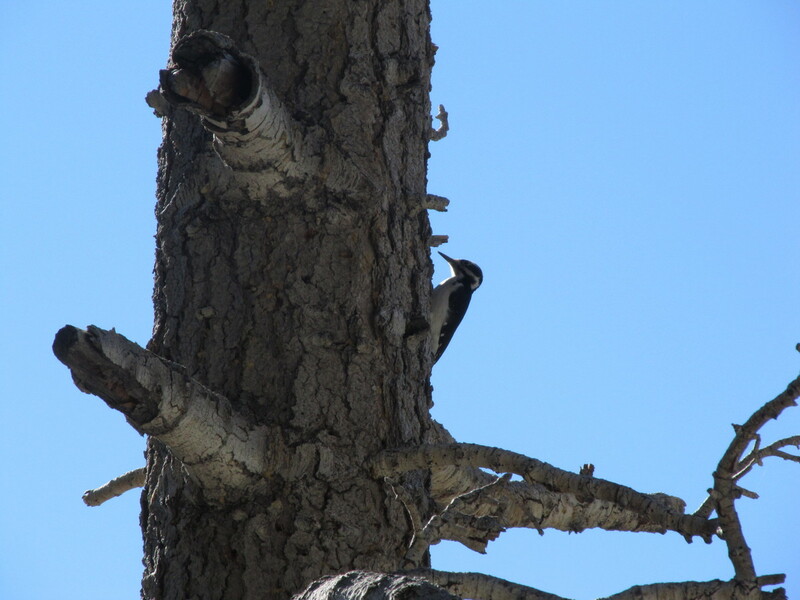 We also heard a woodpecker, and we were lucky enough to see it going at the trunk of a dead tree. Because it was Saturday instead of a weekday, there were a lot of people on the trail. That was all right. It was just strange, since last year’s hikes left me with the impression that all these trails are deserted. There was a small crowd at the hut about halfway up the mountain. And a very friendly Golden Retriever named Butter, who begged snacks from everyone there. Leaving the hut, we walked across the bowl to the place where the trail climbs steeply up the ridge to the south of the summit. 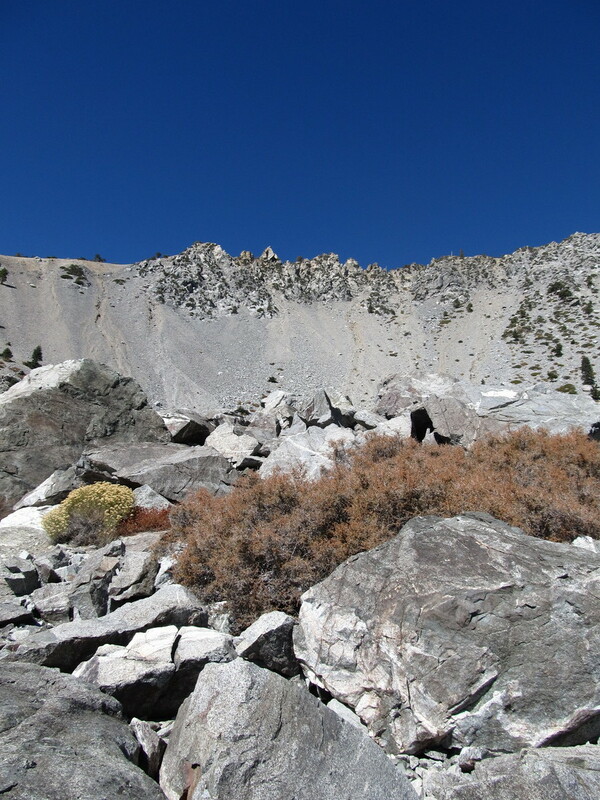 In the bowl, there is a big field of boulders, and it’s pretty obvious that they all fell from the crags at the top of the ridge. I couldn’t help but wonder what that must have sounded like. 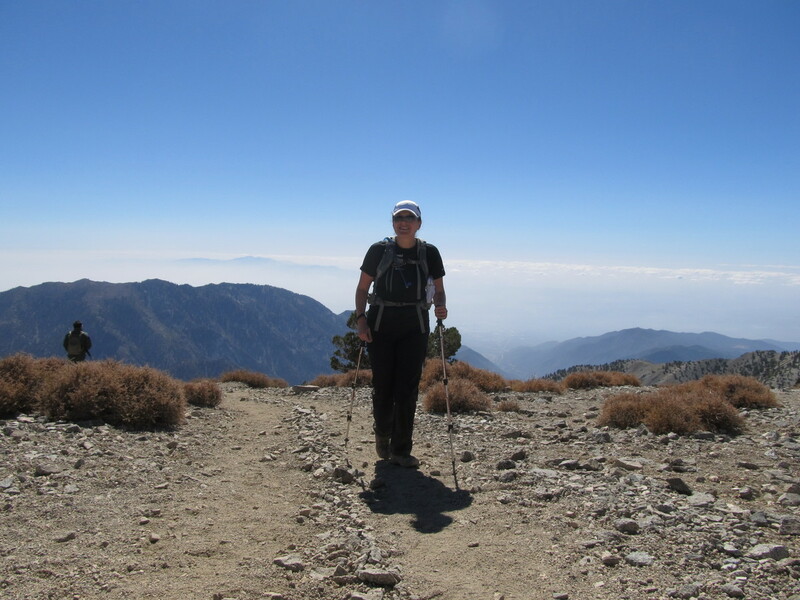 The last part of the climb to the summit was hard. Just as hard as it was last year. But we made it, and we settled in for lunch on top of the mountain. Just us and about fifty other people. At least with that many people up there, there were lots of people for the bees to bother, so they didn’t bother us so much as when we were the only ones there. 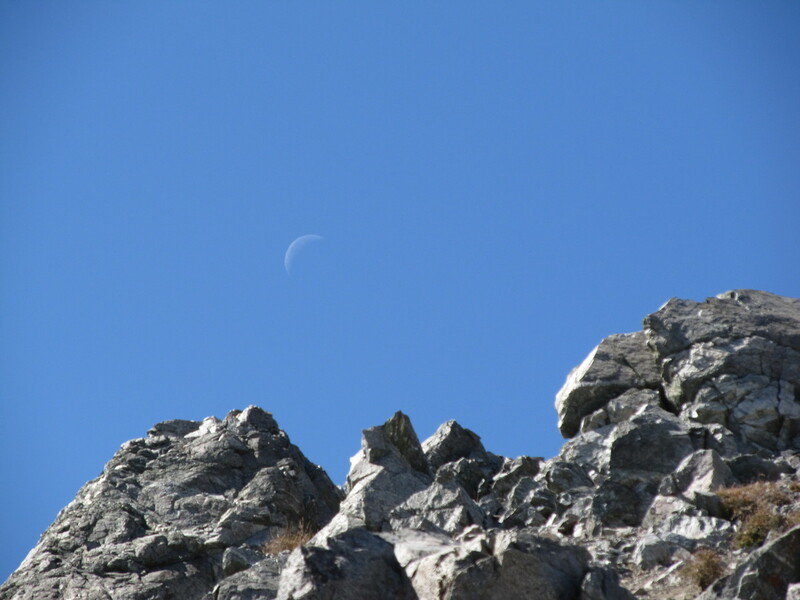 On the way down, I stopped to take a picture of the waning crescent moon hanging just over the rocks below the summit. And I also got some pictures along the trail. 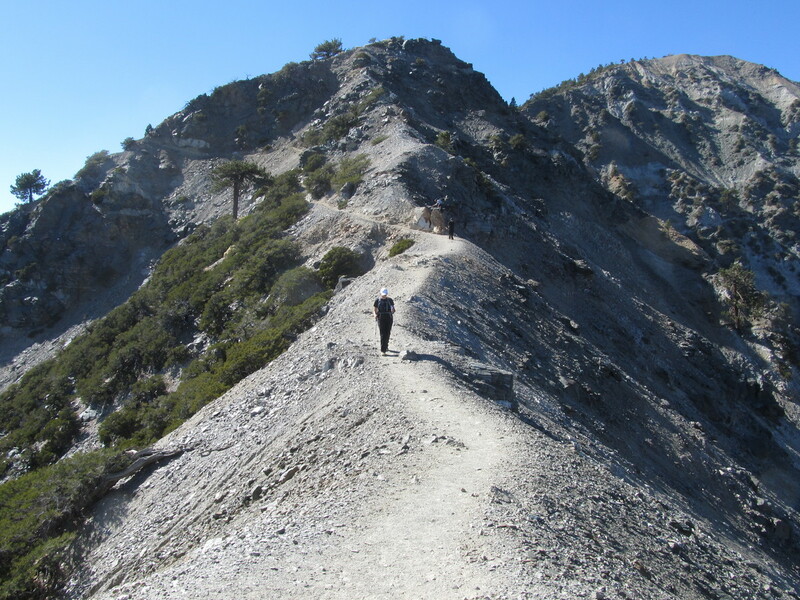 I’ve decided that there are parts of the Devil’s Backbone trail that really give me the willies. But that’s all right. We made it down just fine. At the ski area, they were getting ready for ski season. There were some crews practicing rescuing people from the chair lift, and there were CPR dummies spread out on a blanket nearby. We went in the restaurant so I could refill my water bottle. 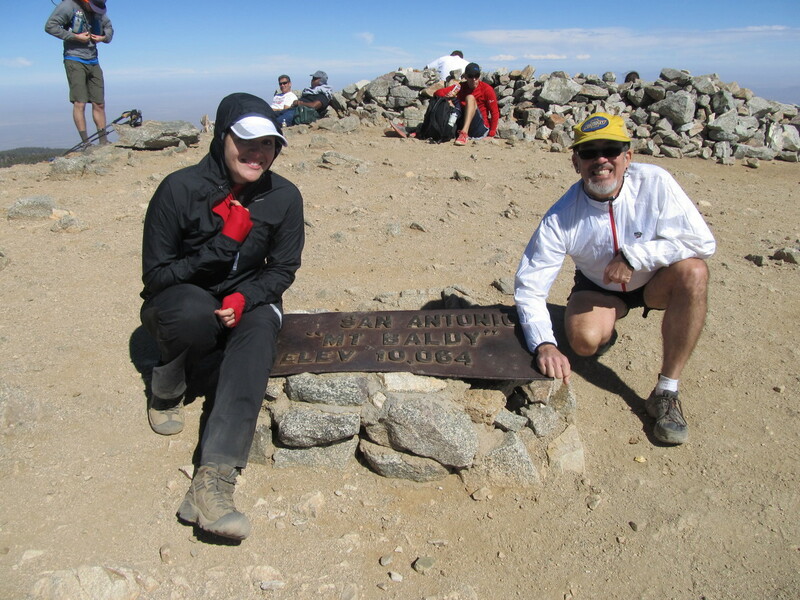 And we got a picture, looking back up at the summit. 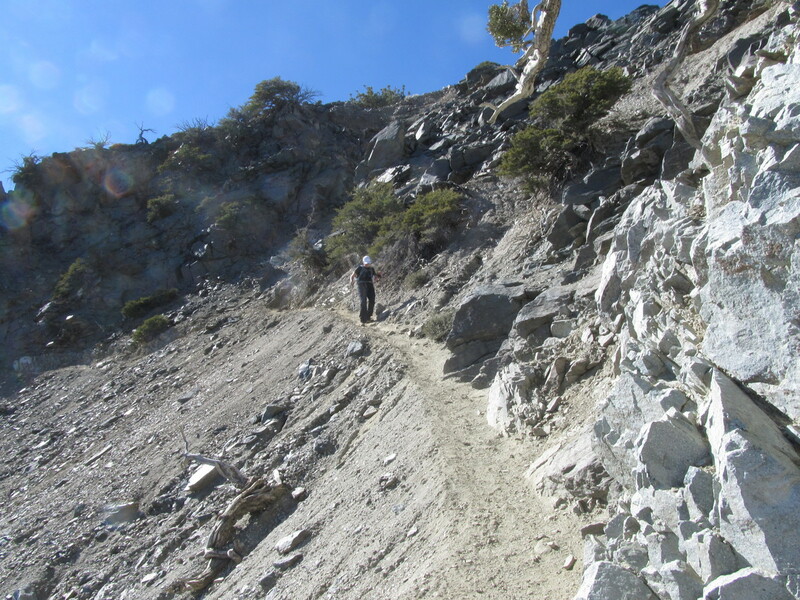 Then we started down the service road back to Manker Flat. Like last year, the service road seemed to go on forever. It’s long. But I was expecting that this time, so it was all right. And we made it back to the car just fine. According to my little GPS thingy, it was 4 1/4 miles from the start to the top, and it was 10.9 miles for the whole loop. Good fun.